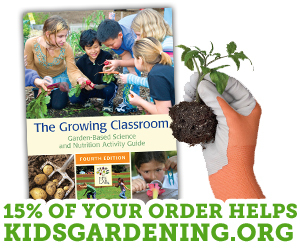 Don't let cold weather slow down your classroom's gardening efforts! Use winter months to extend “green” experiences by cultivating indoor gardens. Most schools garden during the fall and spring, but by incorporating plant activities indoors you can reap the benefits of hands-on, interdisciplinary horticulture lessons year round. Using grow lights or sunny windowsills, your class can experiment with growing a wide range of plants, from houseplants and blooming bulbs to edible crops like radishes and lettuce. Kids get excited watching nature in action indoors while most everything outdoors is tucked in for the winter. The simplest form of indoor gardening is to place plants in windows that receive a decent amount of light. Windows that face south and west are best and they usually receive enough light to grow leaf and root vegetables (beets, carrots, lettuce, onions and radishes) and herbs. East and north facing windows receive less light and are ideal for many houseplants. You will need to spend a few days monitoring your window space to determine how much light is naturally available for an indoor garden. Using grow lights (fixtures with fluorescent lamps designed to hang low over growing areas) expands the range of plants you can grow successfully, especially during the short, dark days of winter. Gardening under lights also makes it easier to raise healthy seedlings to transplant into the outdoor garden come spring. To prep a windowsill garden area, one of the primary concerns is protecting the windowsill or table from water damage. You can place your pots in individual saucers or in a large plastic tray to catch drainage. Have students figure out how many plants you can keep healthy in the space you have available. To install grow lights, follow the directions included, abiding all safety precautions. If you plan to build your own light stand, look for an approved design on the Internet or in books and have your school district's electrician (if you have one) review your construction plans. Containers – You can use just about anything for a plant container as long as it has drainage holes so water doesn't pool around roots. Plastic pots are the most common containers because they are generally inexpensive, can be reused, and are lightweight. Clay and peat pots are other common options. You can also use recycled containers as plant pots. School milk cartons, plastic yogurt cups, egg cartons, and plastic soda bottle bottoms are all possibilities -- just be sure to punch drainage holes in the bottoms! Growing Medium – The growing medium in which you raise your plants is important. It anchors the roots so the plants don't fall over and serves as a reservoir for water, air, and nutrients taken up by the roots. The best medium to use in pots is soilless potting mix, made from peat moss (or coco peat), vermiculite, and/or perlite. Some mixes also contain added nutrients in the form of slow-release fertilizer or mineral amendments. Soilless potting mix is light enough to allow for good water drainage, root aeration, and root movement, yet heavy and spongy enough to anchorage and to hold adequate water and nutrients. It's easy to transport and readily available in most garden stores. Most are sterilized so that they do not contain weed seeds, insects, or diseases that could flourish in the favorable conditions of an indoor garden. Additional Supplies – You may need plant labels (popsicle sticks and plastic silverware work great), watering cans (try plastic water bottles or milk jugs) and fertilizer (liquid or slow-release). The indoor environment does not provide as much light as an outdoor garden. Grow plants with lower light requirements or provide additional lighting with grow lights. If you move plants from outdoors to your indoor light garden, they may go through an adjustment period and lose some leaves because of changes in light and humidity levels. Give plants time to adjust to the new conditions before giving up on them. Better yet, ease the transition by gradually moving outdoor plants to shadier conditions over the course of a week before bringing them inside. Weekends and school vacations may make watering classroom plants a challenge, especially tiny seedlings that dry out quickly. Self-watering planting systems with water reservoirs can provide needed moisture to plants over weekends and breaks. You may also be able to get school staff like custodians to care for plants when school isn’t in session. Established plants that are well-watered beforehand and perhaps moved out of direct sun can generally weather weekends and shorter vacations without problems. Check regularly for pests such as aphids and spider mites as well as for signs of disease on leaves. Isolate and treat affected plants quickly to avoid having the problem spread to nearby plants. When choosing a location for your indoor plants, consider accessibility. Students will need room to water and monitor plants, and custodians will need space to clean around your indoor garden. Make sure that area is dedicated to growing so plants are not knocked onto the floor by accident. As with any youth gardening project – remember to HAVE FUN!